Our range of products include wire rope pulley block, single sheave wire rope pulley and triple sheave pulley. We are instrumental in wholesaling and trading Wire Rope Pulley Block Snap, which has earned us loads of appreciations and huge profits. The offered product is made from high grade material and has been tested for the assurance of quality by our diligent group of professionals. It is used for lifting line setting, pole setting and heavy loads in coal mines and civil engineering sites. We are known for timely delivery of orders as well. We have set a benchmark in the industry for wholesaling and trading Single Sheave Wire Rope Pulley. 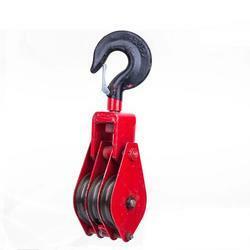 The offered product is used for lifting heavy equipment and line pole at mines and construction sites. It is resistant to corrosion, wear & tear and acids. Being made from high quality of material, it is sturdy and is highly demanded. Our product range is in compliance with the prevalent market trends. 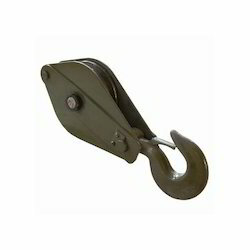 We are among the veterans in the industry for wholesaling and trading Triple Sheave Pulley. 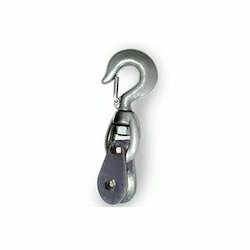 The product is ideal for suspending ropes and lifting heavy loads in shipyards and coal mines. It is sturdy and highly durable owing to the use of high quality material for making it in an innovative manufacturing unit. Our product range is wide and comprehensive for meeting with all the requirements of our customers. Looking for Wire Rope Pulley Block ?